The average price of the cheapest tickets across English football has risen at almost twice the rate of the cost of living since 2011. 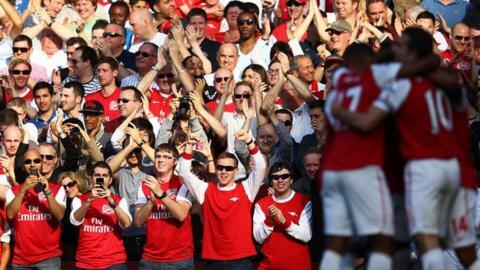 BBC Sport's Price of Football study analysed how much fans are charged at 207 clubs. The average price of the cheapest match-day ticket from the Premier League to League Two is now £21.49. It has increased 13% since 2011, compared to a 6.8% rise in the cost of living. Year-on-year it is up 4.4%, more than treble the 1.2% rate of inflation. Price of Football 2014: What makes the perfect football pie? Critics of the price hikes said clubs had lost touch with fans and argued that the recent £3.1bn windfall from television rights should have resulted in a drop in ticket prices for supporters. But some clubs, particularly those in the Premier League, point to packed-out stadiums as proof they have got pricing right. The Price of Football is in its fourth year and is the largest study of its kind in Britain, covering 176 clubs across 11 division in British football and 31 clubs from 10 different leagues in Europe. As well as ticket prices, information was gathered about the price of replica shirts, pies, programmes and a cup of tea. For the first time this year Price of Football worked out the cost to supporters for each home goal their team scored. In Scotland's Premiership the average price for the cheapest day out at Premiership matches, including a match-day ticket, pie, cup of tea and a programme, increased by just 61p to £26.95 from last season. Visit the Price of Football calculator to see how much you spend supporting your team. Premier League transfer spending hit a record £835m during the summer window, up from £630m the previous year, boosted by the bumper television deal, which was 70% higher than the previous package. This summer financial analysts Deloitte said Premier League clubs now spend 71p on wages for every £1 generated, the first time the 70p mark had been broken. Match-day revenue increased by 6% in the Premier League last season to £585m. Yet as well as the cheapest match-day ticket rise, the average price of the cheapest Premier League season ticket has increased 8.7% since 2012, from £467.95 to £508.55. Shadow sports minister Clive Efford MP said the "inflation-busting" increases "just cannot be acceptable", while business leader Justin King, former chief executive of Sainsbury's, believes clubs need to ensure they are providing value for money to fans if they want to be sustainable. "Any business that thinks it can simply rely upon the loyalty of its customers, regardless of how they treat them, in the end will fail. It's an absolute fact," he said. The Football Supporters' Federation had called for clubs to use the TV deal to cut ticket prices, saying they could knock about £30 off each ticket and still generate the same revenue. Malcolm Clarke, chairman of the group, said there was "no excuse at all" for the continuing rises. "Three times the rate of inflation is completely unacceptable from an industry that's got megabucks going in at the top," he said. Despite the ticket price rises, Premier League attendances are on the increase. The average last season was 36,695. "For the Premier League and our clubs, keeping the grounds as full as possible is our top priority," said Cathy Long, the Premier League's head of supporter services. "The attendances so far this season are very encouraging, with more than 95% of seats sold and average crowds tracking with last season's, which were the highest in English top-flight football since 1949-50." BBC Sport asked Arsenal for an interview but they declined. Instead, they sent us a statement that read: "Work is continually undertaken to offer tickets at various prices, with the highest match ticket only applicable for five Premier League fixtures in a season. "Across the course of a campaign, we offer up to 300,000 reduced price tickets to adult and junior supporters, from £5 and £10." Queen's Park Rangers chief executive Philip Beard added: "Our pricing structure is very fair and I've never had any significant complaints from any fans." "Two months after fans marched on the Premier League's HQ in protest at rising ticket prices, these findings will only serve to reinforce the sense of an impending divorce - between those at the top of the sport and the game's traditional audience. The fortunes clubs have made through unprecedented TV deals have not been passed down and used to alleviate the pressure on fans' pockets, and it is easy to see why many now feel English football is becoming more of a middle-class pursuit, exploiting the loyalties of its customers in order to pay players and their agents more and more. The Premier League argues that prices are based on demand, and they make a good point, with attendance rates again at more than 95%. Match-day revenue is used to improve stadia and attract the best playing talent in a competitive market. Some clubs have made concessions, adopting discount initiatives to help youngsters and away fans. But many supporters will still feel the sport they love is gradually leaving them behind." Crowds in the Football League increased by 136,000 last season. The Championship had a total audience of more than 9.1m fans, at an average of over 16,500 per match. Only the Premier League (13.9m), Germany's Bundesliga (13.1m) and Spain's La Liga (10m) can boast more fans through the turnstiles in Europe. Football League chief executive Shaun Harvey said: "Season ticket holders are making up an ever greater proportion of the supporter base and account for 10 million of the 15 million admissions to Football League matches each season. "As the study also suggests, a consequence of providing greater value to the majority of fans at one end of the spectrum is that those fans at the other end of the spectrum, those adults paying on the day for a single match, may now find themselves paying a bit more at some clubs." BBC Sport contacted clubs in 10 other European countries to find out how prices in Britain compare with those in the Bundesliga, Serie A and La Liga. While some of those clubs sell very cheap match-day tickets, with French side Lille offering one for only £5.87, many charge more than £100 for their most expensive. It is a similar story for season tickets, with AC Milan charging about £163 for their cheapest but almost £3,600 for their most expensive. The Serie A side also have a match ticket that costs about £298. The Bundesliga is often held up as a league that puts fans first by keeping ticket prices low. The four clubs we contacted - Bayer Leverkusen, Bayern Munich, Borussia Dortmund and Schalke - all charge less than £13 for their cheapest match-day ticket. Dortmund's commercial director said Arsenal's match-day revenues were impressive but insisted his club would not entertain the idea of charging such large amounts for tickets. "If we were to ask for prices like this, we would lose the people," Carsten Cramer told BBC Sport. "The people are one of the most important assets for our club. We have to care for them." How many pies pay for Falcao's wage?